Close your rooms for a specific period from today! From section ROOMS, click on Edit on each room line you want to set this rule for. In the next window, look for section RATE OPTIONS and set the value inside the field Close room for next days. 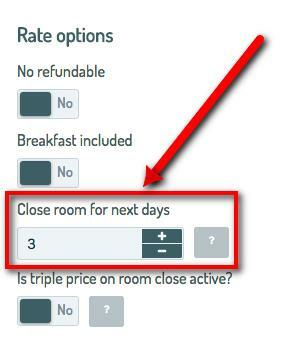 Example: if today is August 10 and you insert the value 3, the room will not be bookable for 10, 11 and 12 of August. Attention! Always remember to click on Save at the bottom of the page.